When you sell something on Reverb via Reverb Payments, you have the option of keeping the funds on your account in the form of Reverb Bucks. Reverb Bucks can be used to purchase items from other sellers who have Reverb Payments enabled on their listings. Convert your earnings into Reverb Bucks to access your funds sooner than waiting for a bank transfer. You can withdraw them at any time and get a 1% discount on purchases when using Reverb Bucks. Reverb Bucks are currently only available in $USD. Other currencies will be coming soon. 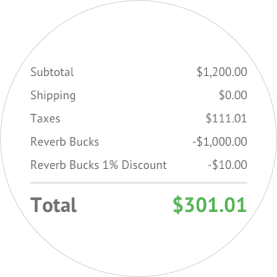 When making your next purchase using Reverb Bucks, you'll receive a 1% discount on the total amount of Reverb Bucks being used. For example, if you have $100 in Reverb Bucks, and buy a $120 record, you'll get an automatic $1 discount (1% of the $100 of Reverb Bucks being used on the purchase). Reverb Bucks from gift cards or promotional credits do not qualify for the 1% discount. Reverb Payments earnings converted to Reverb Bucks do not expire and can be transferred to your bank account on file at any time, in any amount. It’s your money. For more details, please see the Reverb Payments FAQ. 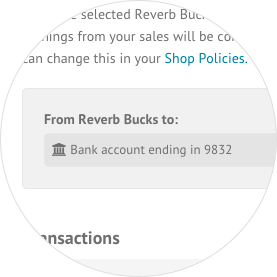 If you have Reverb Payments enabled on your account, you can select to convert your earnings into Reverb Bucks from your shop policies . For more info on Reverb Bucks, see our Reverb Bucks terms and conditions .